Marsden Jazz Festival will celebrate their 25th birthday next year and are offering people the chance to adopt a gig in the festival to raise funds for the stream of free gigs that take place across the festival. Kirklees Council has supported Marsden Jazz Festival previously and last year gave £10,000 to go toward the 70 free events in the festival. However, due to budget cuts the council is unable to give funding next year so the festival hope to raise these funds themselves. For £50, you can adopt a gig at the festival either for yourself or as a gift for a friend or relative. This amount has be raised to £62.50 through GiftAid. Everyone who makes a donation will receive a certificate and have their names printed in the festival brochure. Donors can opt to let the festival choose which gig their donation will support or specify which gig they'd like to adopt. In the run-up to christmas, this would make an ideal gift for a jazz fan or for one of the many people who attend the festival every year. Last year, more than 10,000 people visited the festival. 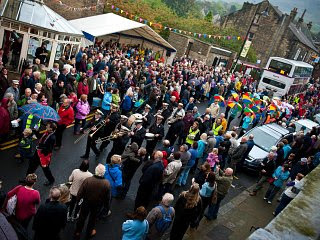 For more information, see the Marsden Jazz Festival website.